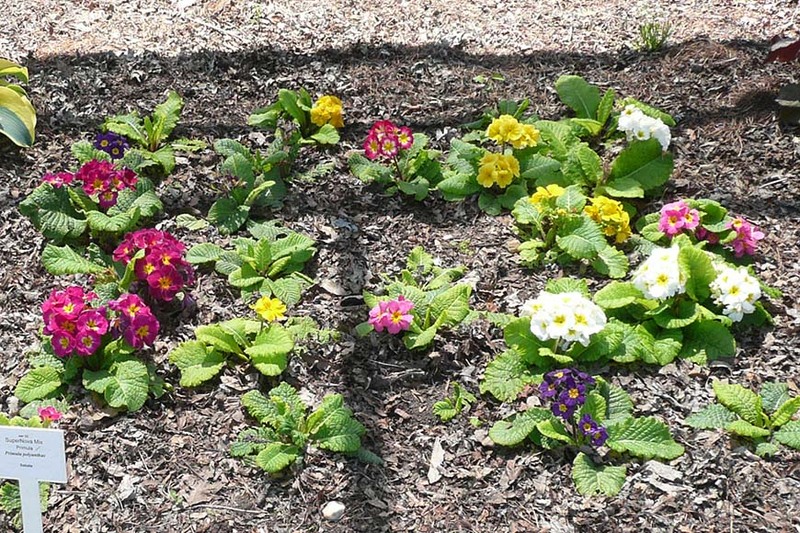 The Perennials Trial was first planted in the Spring 2011. 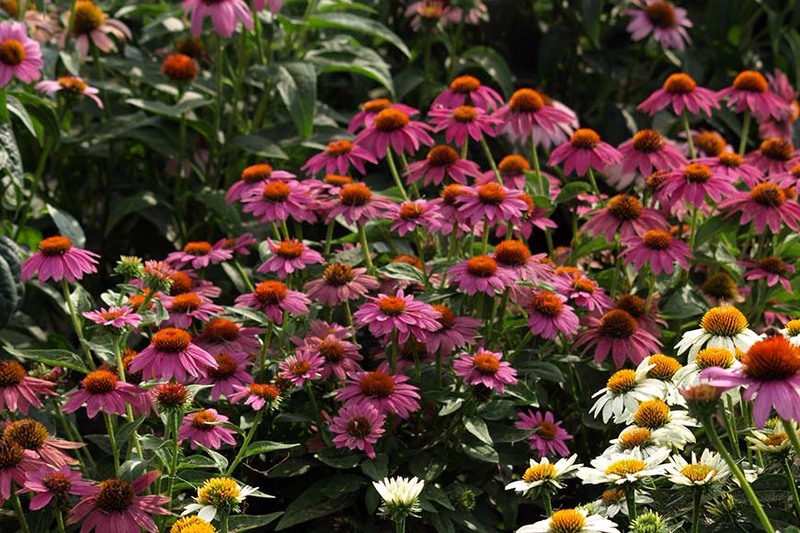 The Perennials Trial were created in direct response to grower, plant industry and homeowner interest. 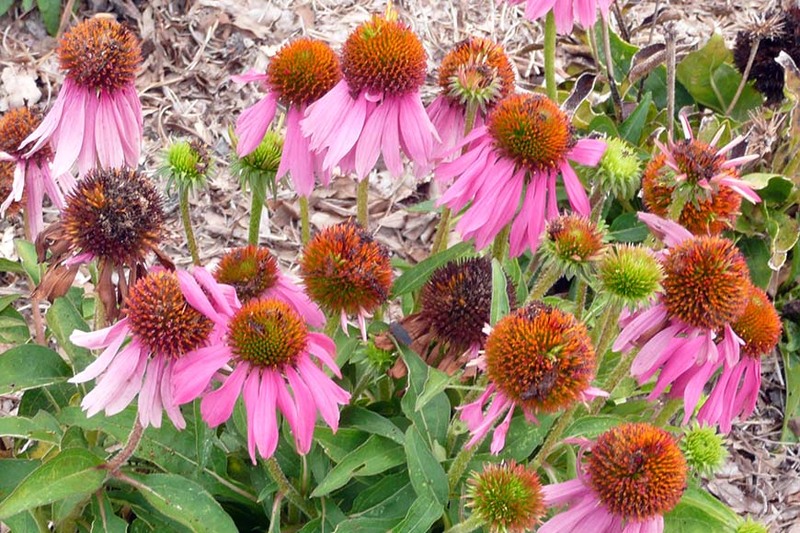 They are located adjacent to the Color Annual Plant Trials at NC State University within the JC Raulston Arboretum (JCRA) in Raleigh. The JCRA is a ten and a half acre site administered by the Department of Horticultural Science and located on 35° 47'N latitude, longitude 78° 42' W, with an elevation of 400'. Plants to be entered into our trials are received in one of three way—seeds, rooted cuttings/plugs or finished plants/pot. Virtually all are grown within controlled greenhouse environments prior to placement in protected outdoor structures for hardening off. Plant spacing in the trials is based on the estimated mature size of entrant that fits to a 4' × 4' area or by the number of plants sent. Each entry is evaluated for two complete calendar years, being removed after the spring flush in year three. After the plants are established, they are evaluated for hardiness and landscape performance with ratings regularly taken. 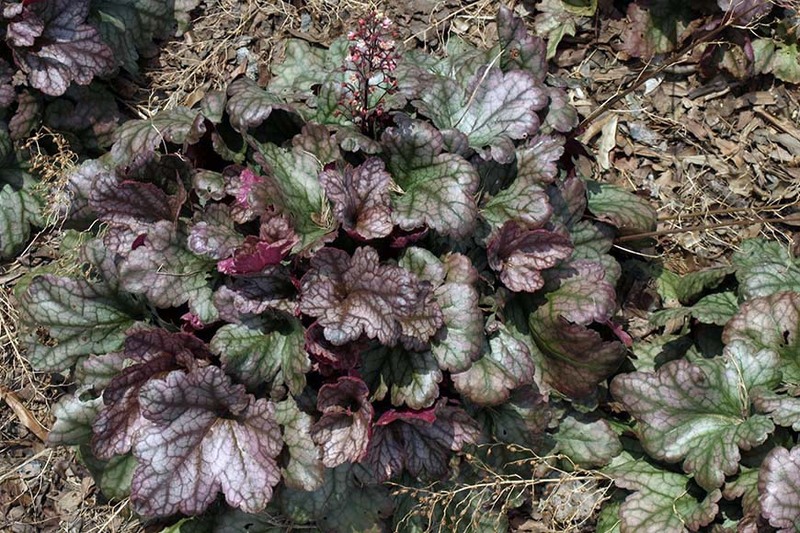 2011 entries on April 29, 2011, and the heuchera, which arrived during the heat of summer, were potted up and place in shade until early fall (2011) when they were planted in beds. 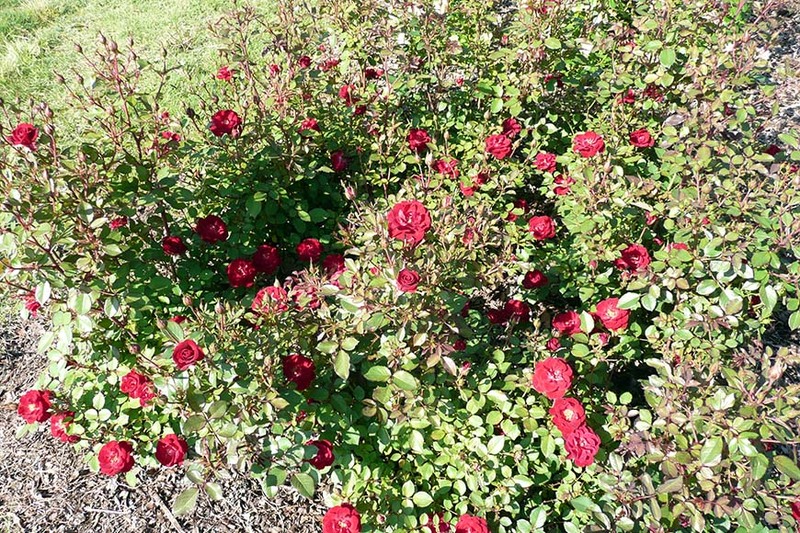 2012 entries on April 10, 2012, and the rose entries were planted on September 25, 2012. Summer 2011 was extremely hot with long stretches of temperatures over 90°F and multiple days exceeding 100°F, including a record-breaking five consecutive 100°F+ days. This heat was followed by periods of normal temperatures with heavy rain. The winter season (2011–2012) was very mild. During the month of December, we broke two high temperature records and had one tie for minimum temperature. In January, we experienced several periods of back-to-back nights with low temperatures ranging from 20°F–28°F. Our first and only snowfall occurred on February 19. During the summer season of 2012 we experienced long periods of temps over 90°F with 10 days at/over 100°F. 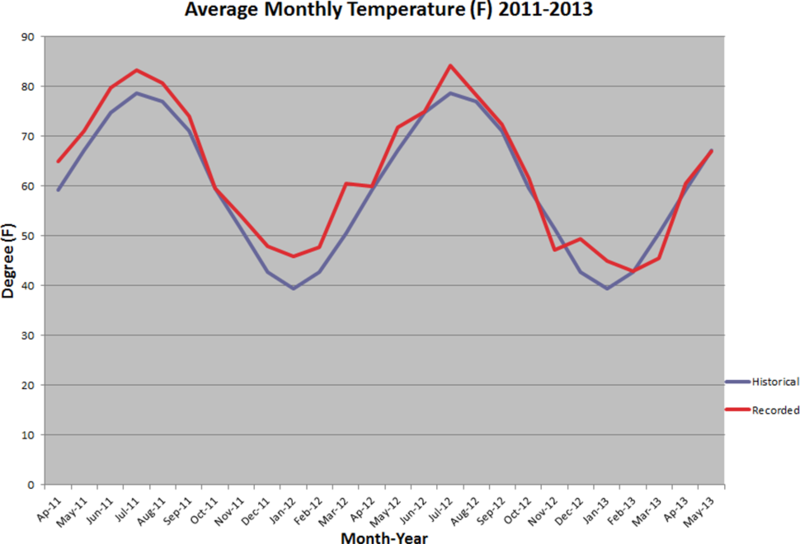 In the month of July, our average night temperature was 74°F. 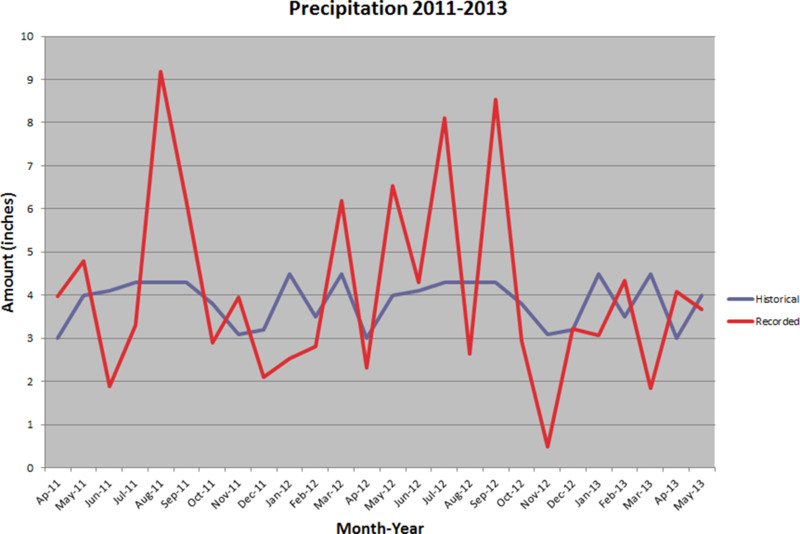 Periodic, heavy rainfall (over 8" in July and September) also plagued this season. The winter season (2012–2013) was one of fluctuating temperatures. The early parts of the season (end of October, November and December) temperatures were slightly warmer than normal. January was mild but February began a cold period with March being unseasonably cold. The average temperatures in March were lower than our historical temperatures by double digits! We experienced three snow events. 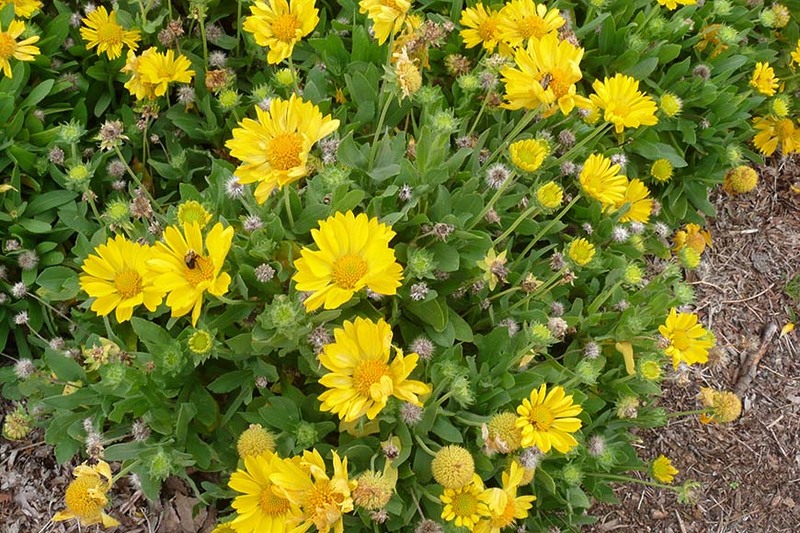 Flowers are a clear yellow color; blooms early- in April; foliage provides interest after bloom. We experienced a problem with genista broom moth caterpillars (Uresiphita reversalis); they ate all the foliage by July 2012, regrowth occurred in September 2012. 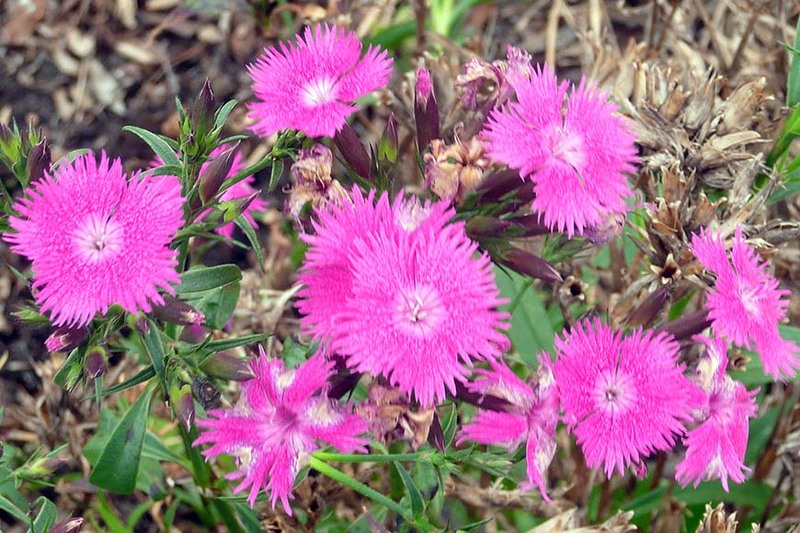 Well-branched, compact plants with a long bloom period; flower color is lavender-pink. Died the first season (in July), never established. Well-branched, compact plants with a long bloom period; flower color is a clear white. Well-branched, compact plants with a long bloom period; flowers are an attractive rose-purple color. Good fall foliage color; forms a neat mound of lobed, dark silvery-green leaves with dark purple undersides. Good fall foliage color; forms a tidy mound of leaves that are red in the spring, turn taupe in the heat of summer, and deep red in the fall. Good fall color—yellows and reds mixed in with the green leaves; has a mounding habit. Good fall foliage color; forms a mound of green and silver leaves. 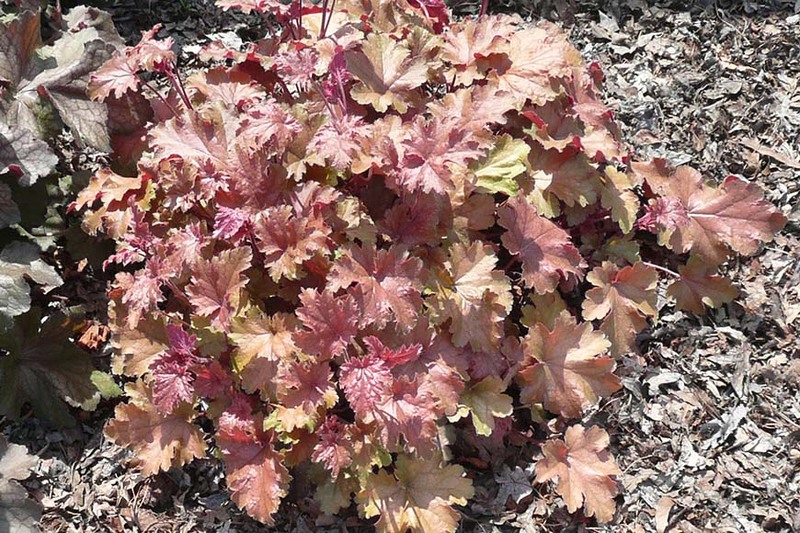 Good fall foliage color; forms a mound of purple with silver-cast leaves. Died Summer 2012. 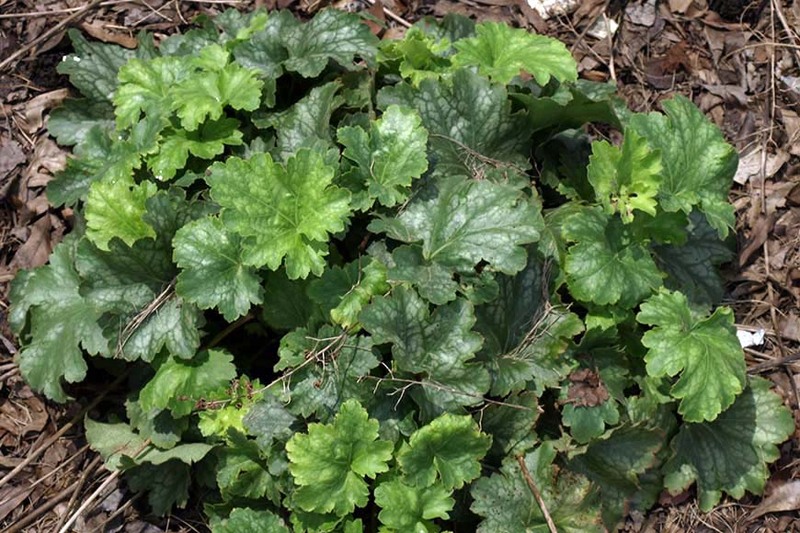 Forms an attractive mound of green leaves with a silver-cast. 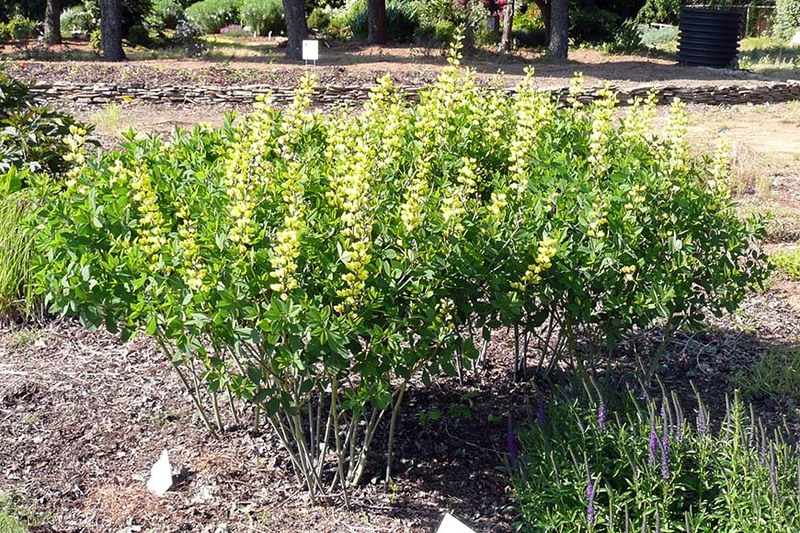 Mound of deep green leaves; golden-yellow flowers with a red eye; blooming period from June to August; maintenance free. Died the first season. Attractive blooms; flower color is an eye catching deep blue. Died 2012 summer. 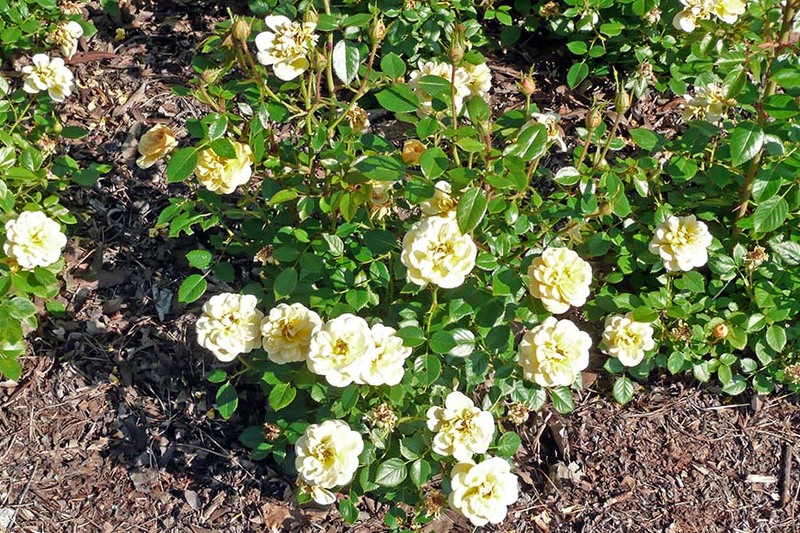 Compact mounding habit; fragrant flowers that are a deep rose color; long bloom period from spring to fall. Low maintenance; flower color is red with splashes of pink; a fragrant (spicy) double flower; blue-green, grassy foliage that keeps it's color year round; mounded form. 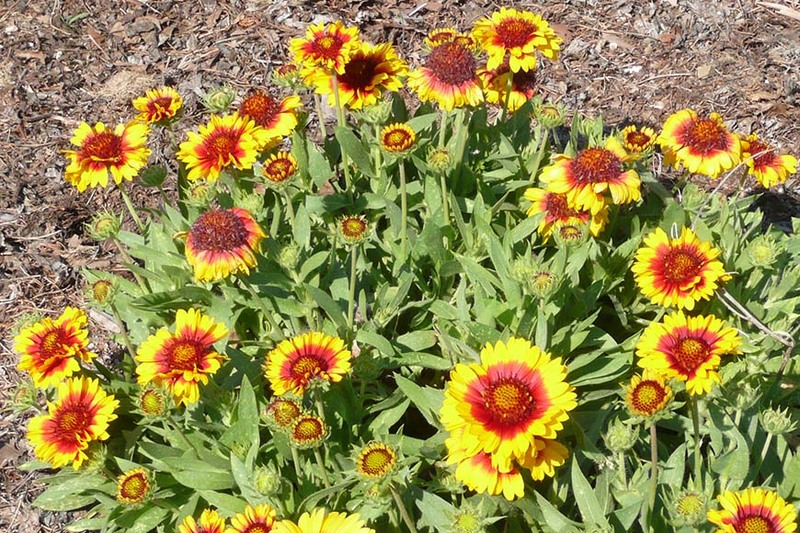 Uniform and well-branched plants- do not lodge; flowers are a bright yellow with a red center ring that do not fade as the season progresses; long bloom season- from April through late fall. Low maintenance; uniform and well-branched plants—do not lodge; flowers are a bright yellow that do not fade as the season progresses; long bloom season- from May to late fall. 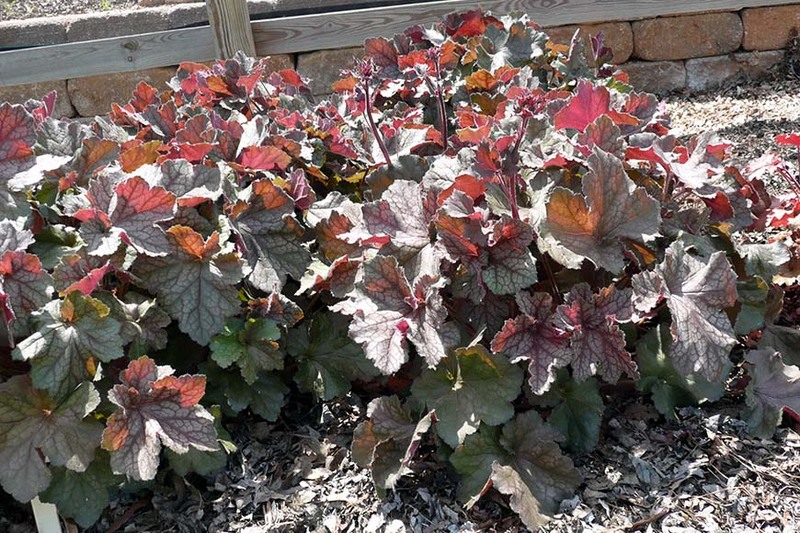 An abundance of large (7”–8” dia), deep scarlet red flowers on uniform plants; leaves have a reddish cast and are deeply lobed; colorful foliage for fall interest. 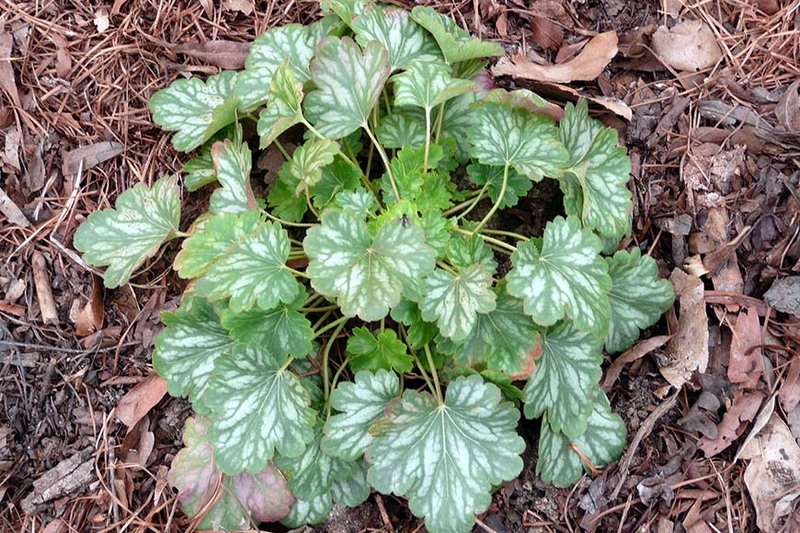 We cut plants back after all leaves had dropped in the fall, but since this plant does not leaf out until spring, pruning foliage any time in the spring before new growth appears is acceptable. (The thick stems are woody, so a sharp pair of loppers is needed to cut through them). 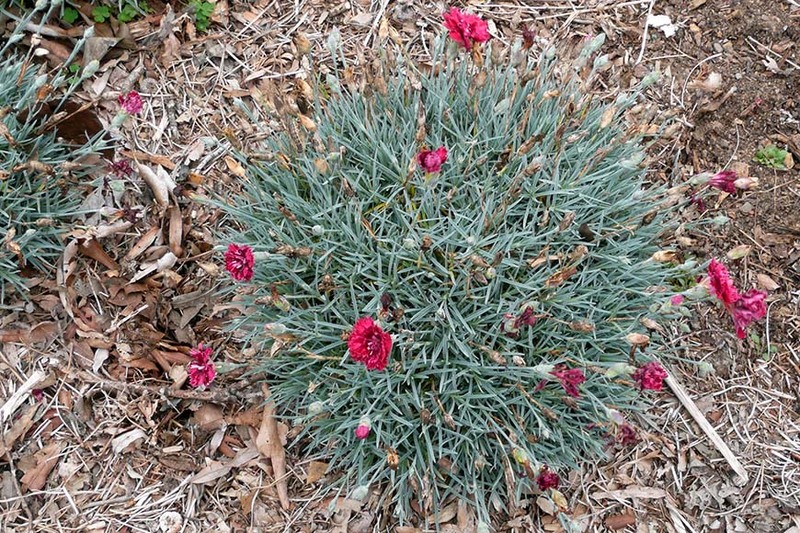 Large, dinner-plate sized (7”–8” dia), red flowers on uniform plants; individual flowers last only one day; slow to emerge in the spring but once new growth begins it leaps. The leaves are an attractive frosty blue with a bright yellow margin; small light lavender flowers; struggled until this year (2013), when it finally started to shine! Died summer 2012. 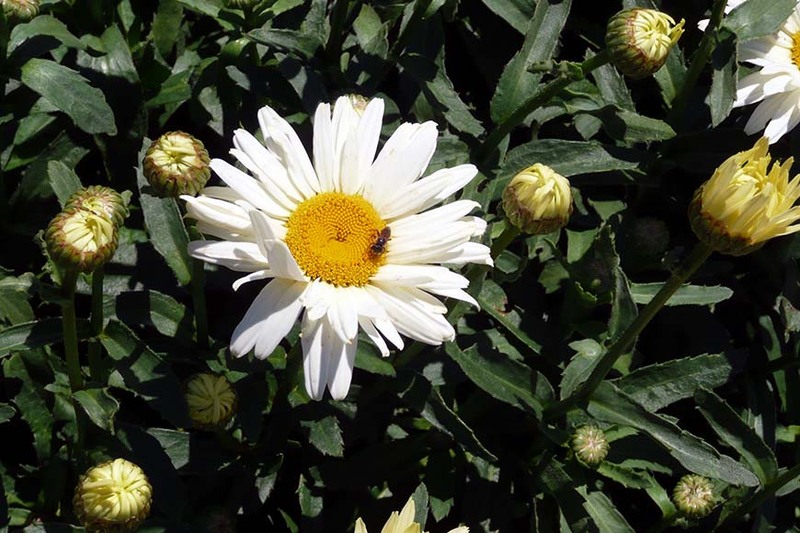 Fragrant, large white flowers on uniform, bushy, well branched plants; both plant and flowers are fragrant; long flowering season- starts in June ends in early fall. Died fall 2012. 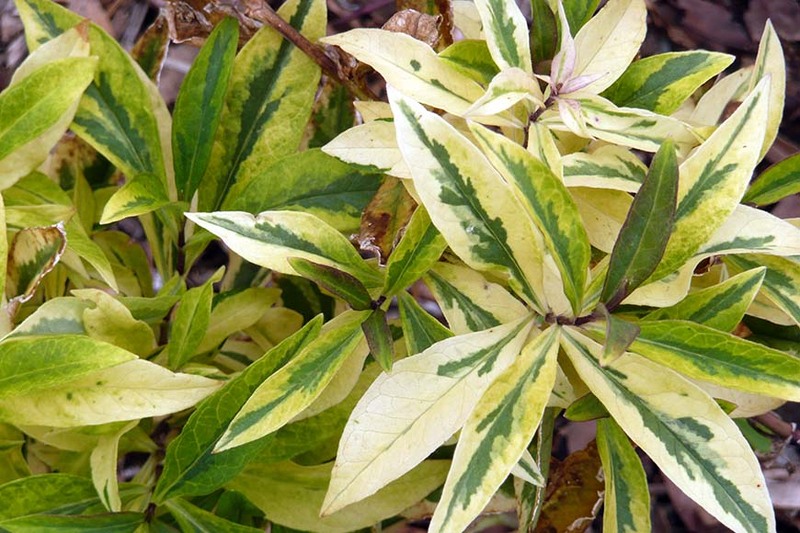 Attractive, eye grabbing variegated foliage- the leaves are green with wide yellow margins; fragrant flowers that are a lavender pink color; plant has upright growth habit; didn't perform as well as expected—substantial winter loss but surviving plants were stunning. 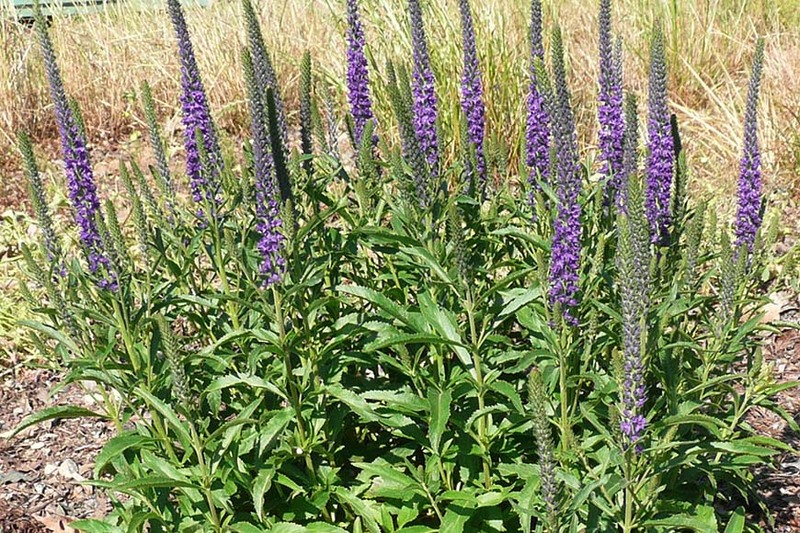 Compact clumps of well-branched plants; deep blue/purple flowers on spikes borne above the foliage; interesting leaf texture; long blooming—from late spring through late fall. 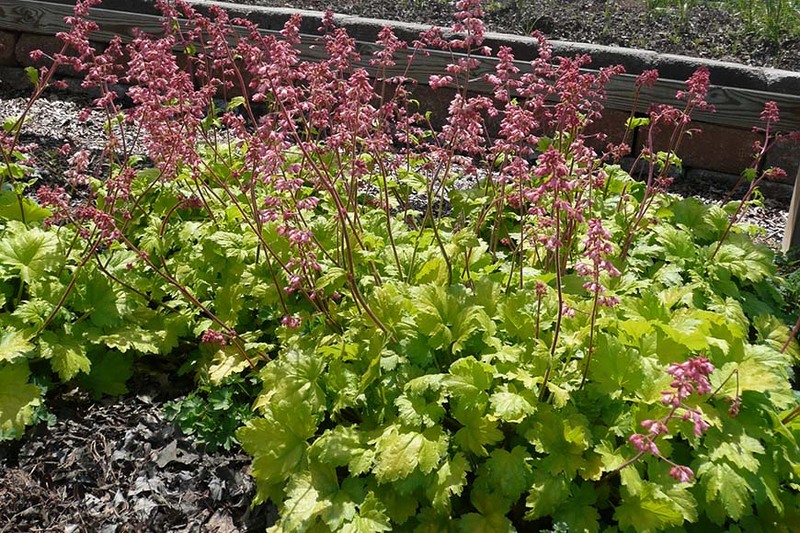 Compact clumps of well-branched plants; rose-pink flowers on spikes rising above the foliage; interesting leaf texture; long blooming—from May through late fall. 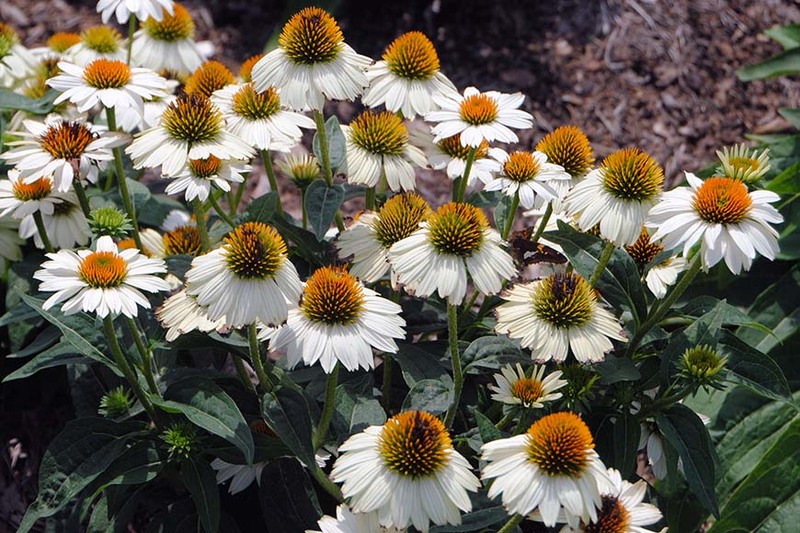 Evergreen, compact clumper with dark green foliage; attractive butter-yellow flowers that bloomed June to mid-August. 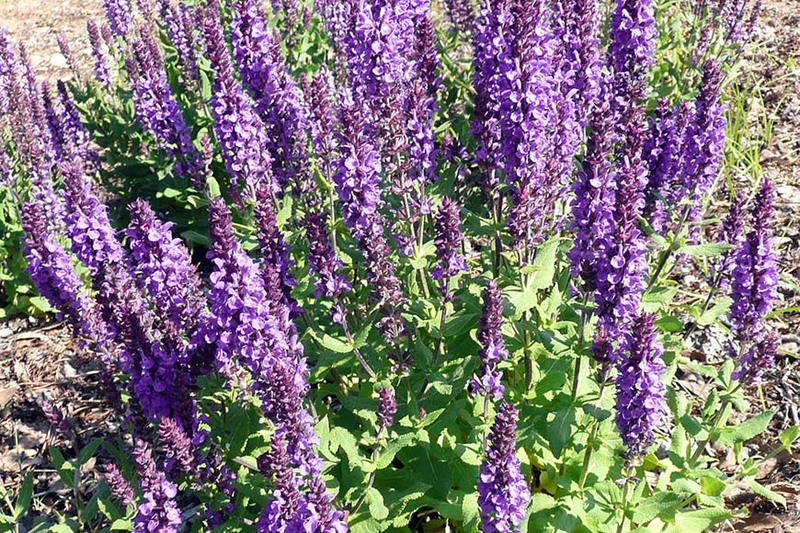 Plants formed uniform clumps of green foliage; attractive long, purple flower spikes; Plants are evergreen; flowered from May to July/August. 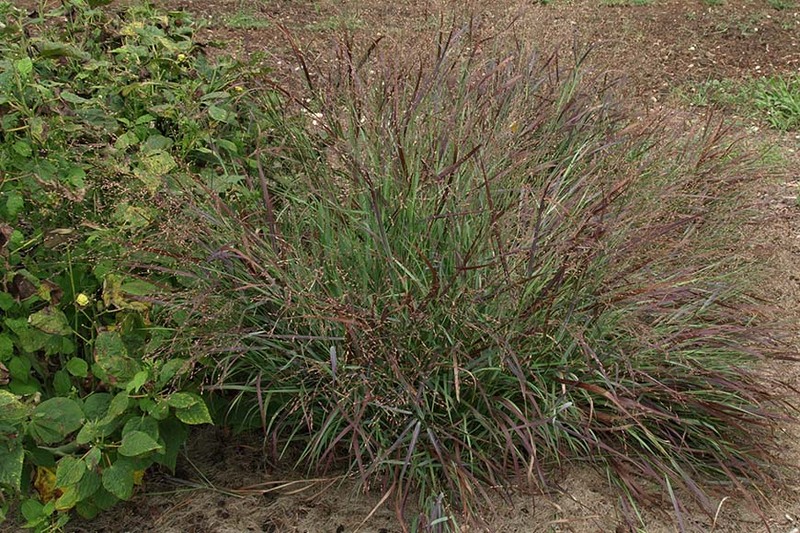 Maintenance free; red to purple panicles form on dense, upright clumps of foliage; the blue-green leaves turn red in early summer; fall interest; good texture. 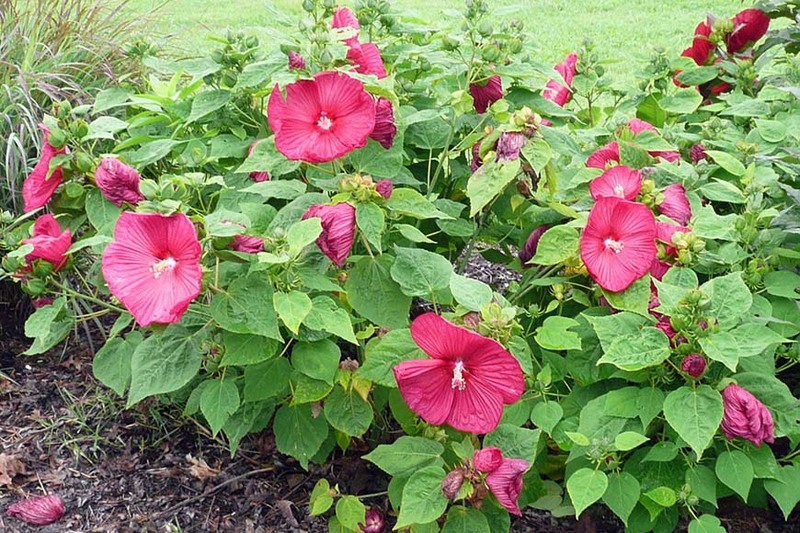 Disease resistant; low maintenance; small blossoms begin as coral colored buds; floriferous plant; mild fragrance. Disease resistant; low maintenance; petite, fragrant blossoms; floriferous plant. Died summer 2012. 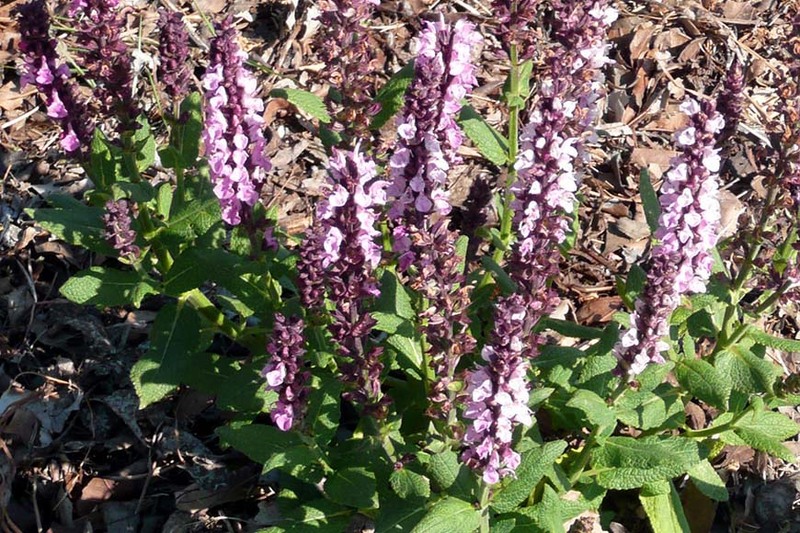 Double, deep purple flowers on sturdy stems; blooms are above foliage; compact plant habit; grey-green leaves. Pendent rose pink bell-shaped flowers on slender stems; flowers are nicely displayed above the green foliage; vigorous growth—takes over an area. 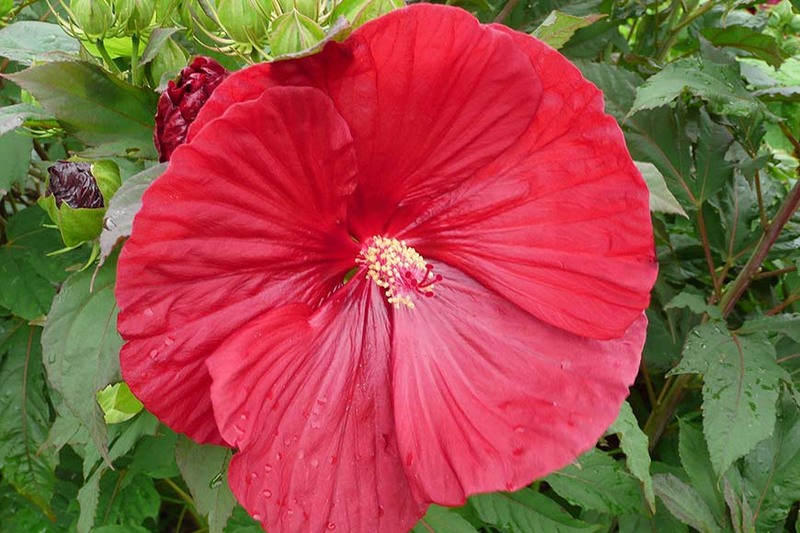 Large, red colored flowers with a little yellow eye that don't fade in the sun and the heat; vigorous grower but compact; it forms an attractive well- branched mound; continuously blooming; plants are evergreen. 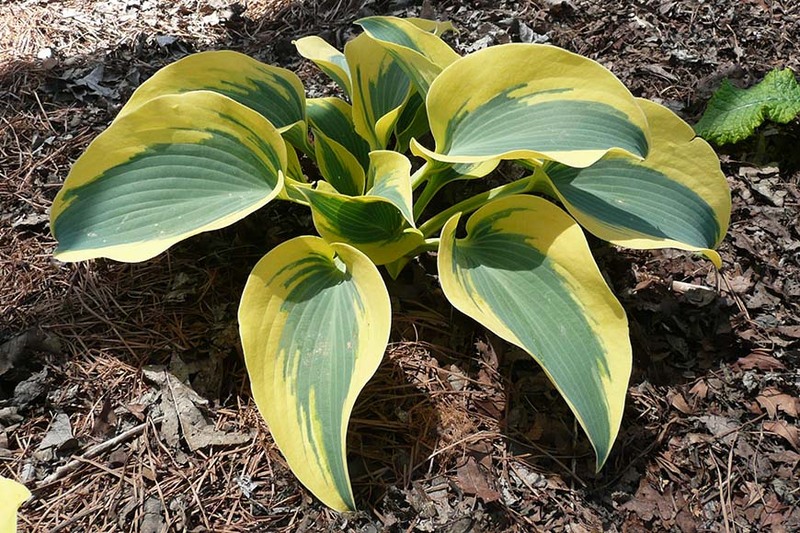 Shade garden; a mixture of clear, eye-catching colors (one color per plant): lavender, pink, red, violet-blue, white, or yellow, all with yellow centers; the flowers emerged in the center of wavy green leaves; low maintenance.